When Canada last won the world championship in ice hockey, I read an article where it said that Canada had turned a new leaf in its approach to the world championships. In all the hegemony, the Canadians were saying that they no longer viewed the games as a guys holiday, with a chance to play some hockey in between and that every player there was playing to make their country proud. The same could not be said of some of the Canadian players at the 2012 team. Three days into the games and what has Canada done? Played a sluggish game against Slovakia and then lost to the USA in overtime. Before the Slovakia game it was reported that Canada cancelled its morning skate and a short while after it emerged that the Canadian players had been sampling the wares at Henry’s Pub in Helsinki. After the USA game reports emerged that the Canadians were parting until 3am at Circus in Helsinki. There were a few tweets that suggested that there would’ve been fisticuffs involved at the end of the night as well, but no official word on the fight have emerged. (EDIT 11:14BST 08/05/12) There have been further updates on what has supposedly been said and I thought that I’d update the story. Getzlaf reportedly shook his fist and said “You don’t want any of this” and reportedly said that he would “knock everyone out in three minutes.” It would appear that the initial reports of the scuffle weren’t as bad as first thought, but there was some shouting. Some outlets have also reported that Getzlaf also shouted he was the captain of the Anaheim Ducks. Maybe not the smartest thing to shout at the heat of the moment, given that Finns follow the Ducks closely because of one Teemu Selanne. The original text that appeared in this blog can now be read at the bottom of the story. IF the Canadians keep going like they are they will be one of the biggest disappointments of the games. There are two players on that roster that have looked like they actually want to be there and play for their country and that’s Jeff Skinner and John Tavares. All the Getzlaf’s, Corey Perry’s and the like are in summer holiday mode. Getzlaf even admitted that he did not play or get on the ice for a month before the tournament. Is this the type of player you want wearing the C for your team? Is this a good example of leadership? The only thing Getzlaf is capable of leading at the moment is the off ice activities for Canada. I think he picked out a few favourite joints to hang out in during the NHL opener in Helsinki. I tweeted last night saying that Ducks should seek to trade Getzlaf. He is on the final year of his contract, but I don’t think the Ducks should commit their long term future to a player who is good when he wants to be. Getzlaf can be a great player when he wants to be, but most of the time he looks like he doesn’t want to be. As for Canada for the rest of the tournament? You can never count them out, that’s for sure, but will all the off ice activities and enjoying a roadie with the boys lead to the teams’ demise and out of the medal games. It’s OK to party to get the game out of your system, but when you are playing for your country, make sure that you do it in the off season, not the night before the game. More details have emerged from the Canadian players’ night out on town. There was a bit of a scuffle at the bar when Ryan Getzlaf took exception to a group of Finnish men at the bar. There had been some back and forth verbalisation before slight pushing and shoving. Getzlaf reportedly shoke hist fist vigorously and said “Don’t make me use this, I will strike you all down.” The bouncers broke up the blossoming brawl, and moved the players out of the club, but there was more shouting outside. The games themselves were a bit sluggish. France held on valiantly for a period and a half before the US team finally clicked and started controlling the game. Rather empathically the French kept trying but the USA team had just way too much skill and speed on its roster for the French to match it. There’s a lot that’s been said about team Canada, with its deep roster of NHL players. However, the game against Slovakia left me unconvinced that the team was something that would send shockwaves across the world. Perhaps part of it was due to the fact that several of the key players on the Canadian roster (Tavares, Getzlaf, Perry among others) were seen in the Helsinki nightlife the night before the game. There was a lot of speculation that the teams’ moist night out lead to the cancellation of the morning skate. Canada was visibly sluggish in the first period and the Slovakian’s held on to the very end, even if the Canadian team started to find its legs. I wouldn’t say that Slovakia will be a ‘pushover’ in these games as it was in the last years world championships. Canada won the game 3-2 in the end, but again, there’s a lot to be desired for from the Canadian team looking at the names they’ve got on paper. Let’s hope that the guys on the roster aren’t treating the World Championship tournament as a roadie with the boys and a chance to have some fun away from home and play a few games of hockey while they’re at it. It is an easy thing to have happen in the world championships. I guess all the Finns remember the rumours from the Moscow world championships a few years ago with supposed helicopter rides to Helsinki and back and not all players being fresh for game days. The Finland vs Belarus game did draw a big-ish crowd, reported at 12,354, which still left almost a thousand empty seats at the arena. The game itself was… well… it was boring. The Finns were in control for most of the game but couldn’t really get anything going. 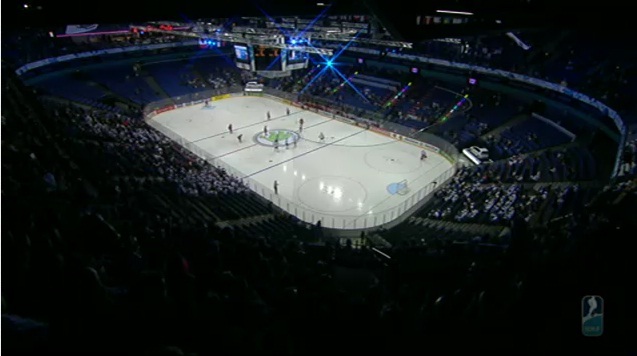 It seemed that the audience in Helsinki woke up to a hockey game in the 3rd period when the first full arena “Suomi” chant was heard. Finland had plenty of power play opportunities in the game but didn’t make anything of it, except maybe prove that the team can pass the puck really well. That being said there were some good things to take away from the game and I’m carefully optimistic about the teams’ chances in the tournament. We won’t know our full capability until games against the likes of Slovakia, Canada and USA. Kari Lehtonen was definitely Finland’s MVP in the game. He had two saves in the first period and was sharp throughout the game when Belarus had some good scoring opportunities. EDIT:It didn’t go that well in Sweden either, where the game between Sweden and Norway only drew a crowd of 5,985 to Globen. Across the three games played in Globen, the games have so far drawn a total of 8,000 spectators. Now on any standards that is poor, specially if it is across three games. One can only hope that the organisers will do something, ANYTHING, to the ticket prices or hire people to come in to watch the games. Otherwise, the 2012 World Championships will forever be remembered for the low attendance. People at the top can say what they want about the cost of organising the games, but no one can ignore the rafts of empty seats at the arenas. It’s not good for hockey or for the reputation of the World Championship tournament. However, the YouTube streams of the games are a welcome plus. I can’t commend the IIHF and its media rights holder enough for getting the games on the web, live and for free. It’s a great feat and its a great way to follow the games, even if the commentators cause some hilarity, bless them though as for most of them, English is clearly not their first language. However, the YouTube streams did cause somewhat of a debacle in Finland. At first, like reported here yesterday, it was said that Finland would be on the geo-blocked country list, but by the time the puck dropped for the USA – France game, people could tune into watch the games on YouTube. It wasn’t until midway through the game that the feed was blocked in Finland. It appears that the MTV3, who has exclusivity for TV rights in Finland had to place numerous calls to the IIHF to get the games blocked as it went against the contract they had signed for the games. Oh well, there are ways around it with different proxy settings and so on, so all is not lost. Hopefully the games will pick up from here and we are in for some great hockey in the tournament and that we will see both the arenas, Hartwall Arena in Helsinki and Globen in Stockholm, filled with fans. Though with those ticket prices the sarcast in me thinks we’ll not see a sold out arena, except for the final. Would Selanne accept a trade for a shot at the cup? Teemu Selanne seems to have found the true meaning of forever young. At 41 years old, Teemu is still one of the best players in the NHL and when looking at him play, he still plays the game with the same finesse as in his rookie year. A career that has seen Selanne achieve many personal accolades, he has truly been an icon for both the NHL and for Finnish hockey. After his Winnipeg career came to an end in a trade that sent him to the Anaheim Ducks, Selanne has called Anaheim his ‘happy place’. After all, he won a cup with the Ducks in 07, which stands as the absolute pinnacle of his career. Despite Selanne taking seemingly longer and longer to decide whether to carry on with his career after each year, he has always come back for another shot at the cup. But with Anaheim playing the way they are, is it completely out of question that Selanne would be traded to another team at the deadline for a shot at the cup? Obviously there are many contributing factors to whether we’ll see Selanne traded, but hypothetically if Anaheim are out of play-off contention by the trade deadline, I do think that Selanne could be traded. He has always said after a confirming “one more year” that he wants to play on a winning team and at the moment Anaheim are anything but. Following the 7th straight defeat to Tornto Maple Leafs, Selanne was visibly frustrated and emotional in the post game interview and was not far from tears. What’s more Selanne at 41, is Ducks’ leading scorer in points. One thing is for sure, Ducks need a wake up call of some sort. Their star studded first line is nowhere to be seen and stars like Corey Perry, Ryan Getzlaf and Bobby Ryan have underperformed dramatically. Dealing one of the big stars might also provide Anaheim with the desired wake-up call, or shake up of the coaching staff, though it is unlikely as Randy Carlyle has recently inked a 3 year contract with Anaheim. To be honest though, it would be high time for a new bench boss for Anaheim, since winning the cup Anaheim have started off slow and have not been able to succeed with Carlyle’s style of play. For the past two years the word from Anaheim’s training camp has been that they have been too intense and that players are already gassed for the first puck drop. Firing Carlyle would definitely serve as a wake up to the struggling Ducks squad, but who would take the reigns from him? Would the Ducks promote an AHL head coach to take the NHL job, a move which has worked well for the Penguins with Bylsma or OK for the Capitals. 1) He will be traded at the deadline if not before to a team with a shot for the cup/ playoff berth. I doubt that he would move to an eastern conference team so a team like San Jose or LA Kings might be a favourable destination for Selanne. 2) Selanne will play the season with the Ducks and play for Finland in the World Championships this spring. Finland is hosting the World Championships this year and despite announcing that his international career finished in Vancouver Olympics, I could envision Selanne going back on that decision for a shot at the World Championship. 3) Selanne will get so fed up with the way the Ducks are playing that he will announce his retirement before the season is done. He has always said that he will play as long as it is fun, and I can’t imagine that he is having that much fun at the moment with the team playing like they are. Though I think this scenario is unlikely as Selanne is a true professional and would not leave a sinking ship until he has done everything in his power to save it. The next couple of months will show the direction Anaheim is headed, but with the rest of the pack getting further and further each game, Anaheim is in a desperate need of a shake up if they are to have any shot at the post season.